A deal that will see 18-year-old striker Omar Alieu Koroma playing for Norwich City on a season-long loan from Portsmouth has been completed. The teenager from the Gambia signed for Pompey after impressing boss Harry Redknapp during a recent trial. 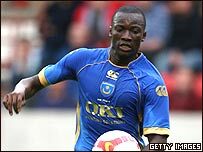 Portsmouth would like Koroma to gain first team experience with Norwich. Norwich boss Glenn Roeder told BBC Radio Norfolk: "Koroma looks exciting and full of enthusiasm, but I don't want to put too much pressure on him." Redknapp believes that Koroma has a big future at Fratton Park. "I've been very impressed with him and I'm pleased that we've got him here," Redknapp told Portsmouth's website. "I like him very much. He's a good kid and he's got the potential to become a very good player. Goalkeeper Stuart Nelson has also signed a one-year contract after spending pre-season on trial with the Canaries.